Yesterday I have been working a lot with porcelain clay. It will be utter whiteness when fired. I'll be combining part of yhe things I made with red so that's were this weeks inspriration came from. 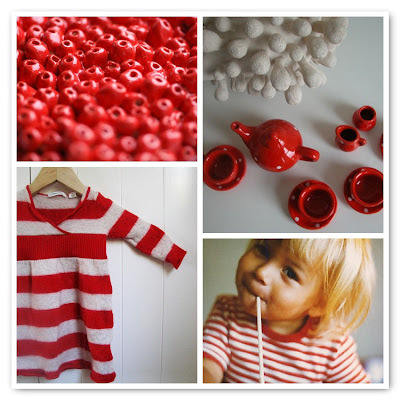 Red & white pop! If it are stripes or dots, I think it's a magic combination. Make sure to check out last week's favorite mosaic. Oops, looks like Mister Linky is being naughty again. If you can't see a place to link, please come back later to link it.